After a day of sightseeing, shopping or sunbathing in Barcelona, it’s time for some serious relaxing. And there’s no better place for a well-deserved cocktail than one of the coolest rooftop bars in town. Thanks to Barcelona’s soft Mediterranean climate, most days (and nights!) of the year the weather is fine for a privileged rooftop session. These 8 best rooftop bars in Barcelona are loved among both tourists and locals. Don’t forget to bring your warm sweater for cozy and romantic winter days and your swimming suit for the hottest summer nights. 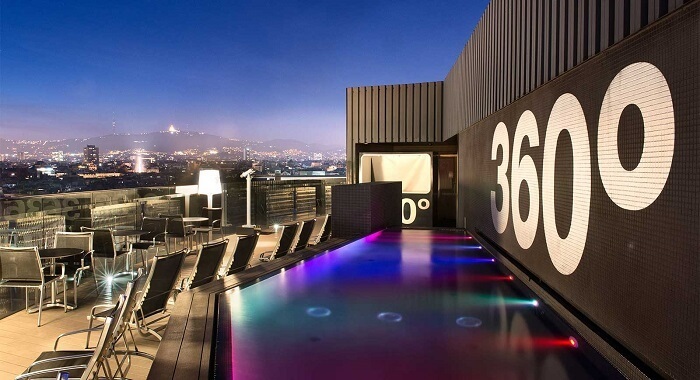 No doubt one of the best rooftop bars in Barcelona is located in Grand Hotel Central (Via Laietana 30, El Born). Take a dip in the infinity pool and overlook the neighborhood of El Born and its wonderful cathedral Santa Maria del Mar. SkyBar is closed for external guests in the coldest months of the year. An absolute eye-catcher in the Raval neighborhood is the cosmopolitan Barceló Raval Hotel (Rambla del Raval 17-21). Take the lift to the 11th floor for the impressive 360º roof terrace and a small but comfortable swimming pool. In summer there’s live music in the weekends. Curious how Gaudí’s Sagrada Familia looks like from a different perspective? Find out on the rooftop of four-star Ayre Hotel Rosselló (Carrer del Rosselló 390, Eixample). With views like these, there’s no need for a swimming pool! Definitely one of the coolest and best rooftop bars in Barcelona. Craving for some fresh air after a day in the crowded city? Go to the terrace – technically it’s not a rooftop bar – of Gran Hotel La Florida, on the Tibidabo mountain (Carretera de Vallvidrera al Tibidabo 83-91). One of the most spectacular views over Barcelona guaranteed, the restaurant serves amazing food and for some refreshment there’s a pool. This rooftop does not belong to a fancy hotel, but to the Museum of Catalan History, located in the old port. You don’t need to buy an entrance ticket to the museum to enjoy the spectacular views over the port and La Barceloneta: just go inside and take the elevator to the fourth floor. The afternoon DJ-sessions known as #BuenasTardesPulitzer are legendary. From mid-May until the end of September this rooftop transforms into a vibrating outdoor café with live music and DJ’s playing on Wednesdays, Thursdays, and Fridays. Definitely worth a visit for those looking for some party. The wonderful rooftop of the H10 Casa Mimosa Hotel also goes by the name ‘El Cel de Gaudí’ because of the spectacular views this terrace offers on Gaudí’s roof full of chimneys, La Pedrera. Apart from the views, you can also enjoy the pool, the hammock area, and of course a drink or bite. Marea Baja (and Marea Alta) is one of the best rooftop bars in Barcelona if you want fantastic views over the city. The exclusive fish restaurant is located on the 25th floor of the Torre Colón and cocktail bar and terrace Marea Baja just one floor down. Here you’ll enjoy a singular 360º view over the city while sipping on a cocktail or trying high-end finger food (mostly fish). Especially recommendable when the sun sets.